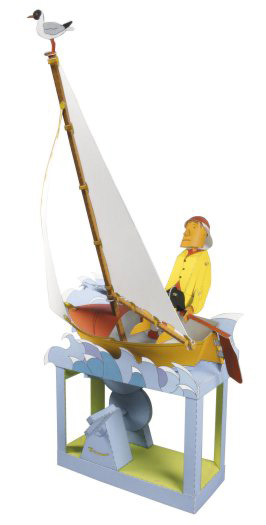 Designed by Walter Ruffler, titled "Into the Wind" (a skipper rides waves in his boat). Walter Ruffler, one of Europe's most accomplished automata designers, makes humorous and sophisticated mechanical paper kits. These paper 'machines' use cranks, levers, wooden sticks, and thread to simulate amazingly lifelike movement. Packaged in a sleeve containing four cards (8 1/2" x 12") printed with model parts, wooden sticks, and complete step-by-step instructions. The kits require glue, scissors, a craft knife, and needle and thread to assemble. Recommended for ages 12 and up. A great gift for tinkerers!